This week guest host Mark is back with a look at one of my favorite cartoon series of all time. The 1960’s era adventure show, “Jonny Quest.” What a cool show for a kid growing up to watch. Mark talks about the series, the background, the music and so on. Here are some words from the man himself. This is Mark Daniels from the Great Pacific Northwest. This week I’m going to take a look at my favorite animated series when I was a kid. It’s The Adventures of Jonny Quest from 1964. I hope you all enjoy it. Take care everyone and Happy Holidays! This is M-5 signing off…. Big thanks to Mark for covering this terrific series. Next week I will be back to talk about some of my thoughts about what I’d like to see in the new, upcoming Trek series. Send in your audio comments (treksf@gmail.com) on that topic as well and I will include them in the podcast. Also, you can support the podcast via Patreon HERE. Until next time take care and enjoy the week ahead. Great podcast! I loved learning more about the creation of one of my all-time favorite show. 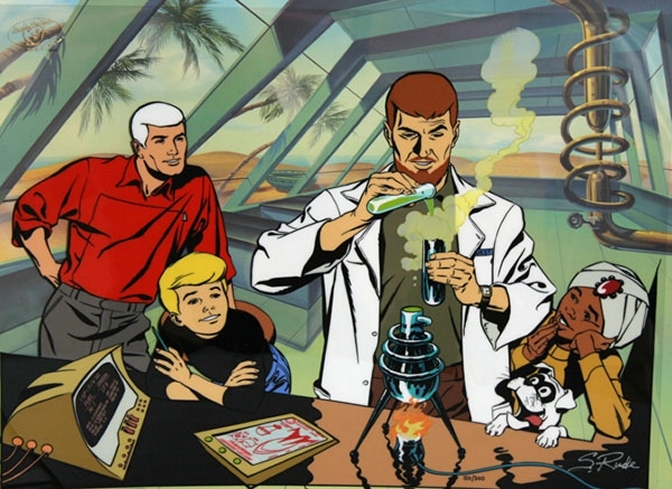 Loved the action, danger and sci-fi adventure of Jonny Quest. Off to watch that doc on YouTub now! Let the Quest continue!